I don’t like vegetables. There, I said it. Yes, I’m an (almost) 31-year-old woman. I pay taxes, I do my own laundry; I’ve unclogged a drain, fixed a flat tire, and dealt with things where my first impulse was to find the nearest adult. I still just don’t like vegetables. I decided a few years ago that eating vegetables was just going to be a necessary evil. I Googled (as we all do so frequently now when we want to know things in the immediate moment that we wonder them) what the most overall nutritious vegetables were and decided to learn to eat them, not like them, but eat them. If I had to force myself to consume something, I may as well go for broke, right? The list included spinach, romaine lettuce, broccoli, kale, Brussel sprouts, and many other foods of the green persuasion (if you’re actually curious of the most nutritious foods, a list can be found here). Some, like kale, I’ve still not developed a taste for; but most can actually be quite yummy if you know how to make them. 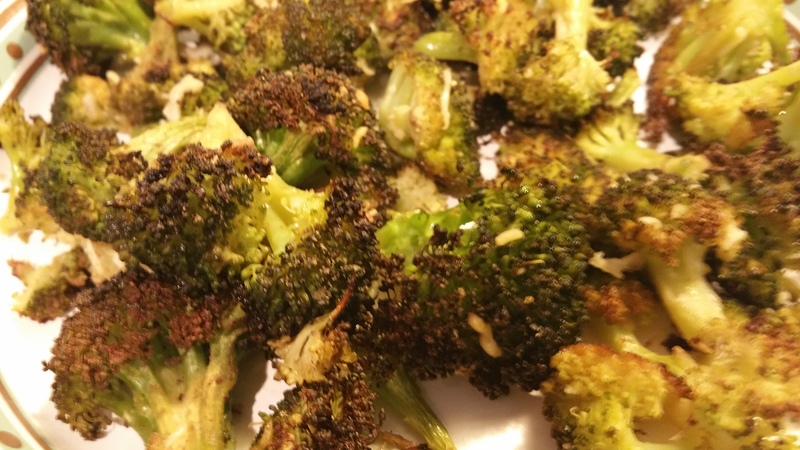 Like the star of today’s show: Broccoli…or, as I used to refer to it: evil little trees. Start with dry, fresh broccoli (frozen won’t work, as it just won’t crisp up right), as much as you desire to make. I will say, it roasts more evenly if it’s chopped up small and uniformly. Grab a bowl, and toss it in olive oil, salt, pepper, and garlic powder (to taste). Lay it out on a foil-lined sheet pan, arrange it in a single layer, and roast in a 400 degree oven for about 20 mins. 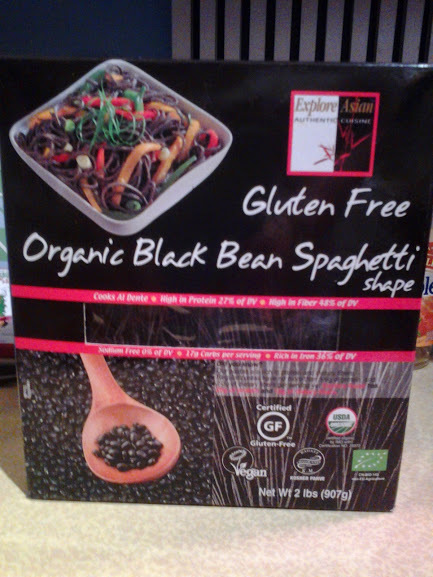 Remove from oven, sprinkle with parmesan cheese (shredded works best, but grated will work fine) to taste. Return once more to oven and roast another 5-7 minutes, to allow the parmesan to brown and crisp. When finished, the broccoli is crisp on the outside, soft on the inside, slightly bitter with the saltiness of the Parmesan and the brightness of the lemon juice. 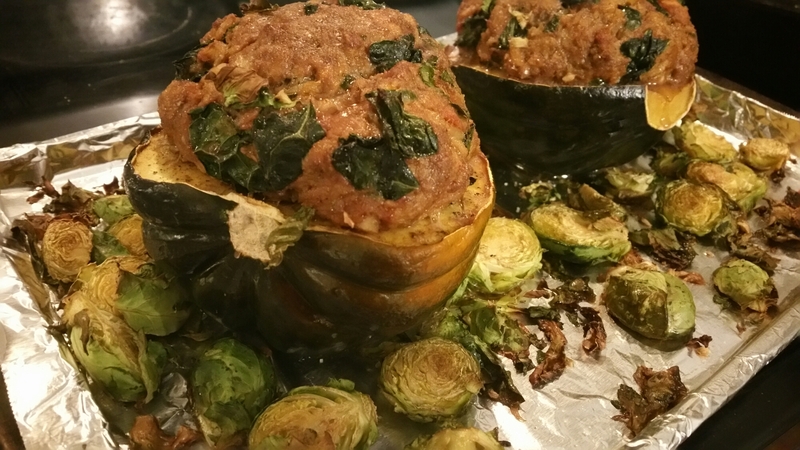 I can literally eat an entire batch by myself, me, the girl who doesn’t like veggies. Give it a try, I know you’ll like it as much as I do. Enjoy! What to do with this chicken from the other day? Hmmm… Chubby Hubby to the rescue! We were watching TV and someone was eating some Asian noodles. I start by putting the noodles on. I got these at Costco and was thrilled to see how much protein they have! As a member of the “Tiny Tummy Club” (15 months post-op for Vertical Sleeve Gastrectomy. That’s another post though.) protein is super important and empty calories are no bueno. Every once in a while you want a treat though, so these are a great choice even if they are a bit high in the calorie department. Obviously, rice noodles are customary with a peanut sauce. I’m also sure that regular noodles would taste good too. the thing I do like about these noodles is that they’re a bit more firm than regular noodles, reminding me more of Soba noodles than plain flour noodles, which worked perfectly for this recipe. It was then a matter of making the sauce. I looked quickly online and saw that the basic ingredients for peanut sauce are peanut butter, chopped peanuts, Sriracha sauce, soy sauce, sesame oil and sesame seeds. Many of the recipes also used coconut milk, but since I didn’t have any I left it out. I honestly just kind of combined the ingredients and taste tested until I liked it and it passed the Chubby Hubby test. I heated all of the sauce ingredients in a pot, tasting regularly, until warm and combined, and then added the chicken to warm up. I did notice that the sauce was a lot darker in color than I thought it would be, but it tasted good. 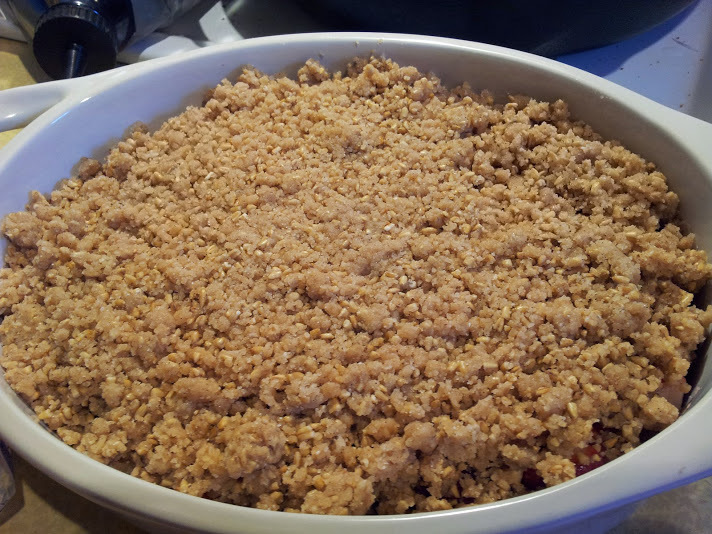 I was actually really pleased with the taste, especially considering I was kind of making it up as I went along (don’t you love it when that happens!). 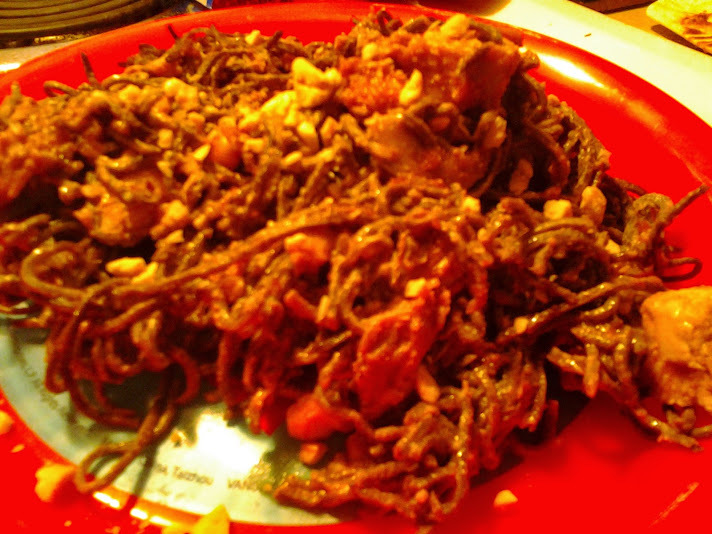 Also, as much as I like these noodles the appearance is not very appetizing. 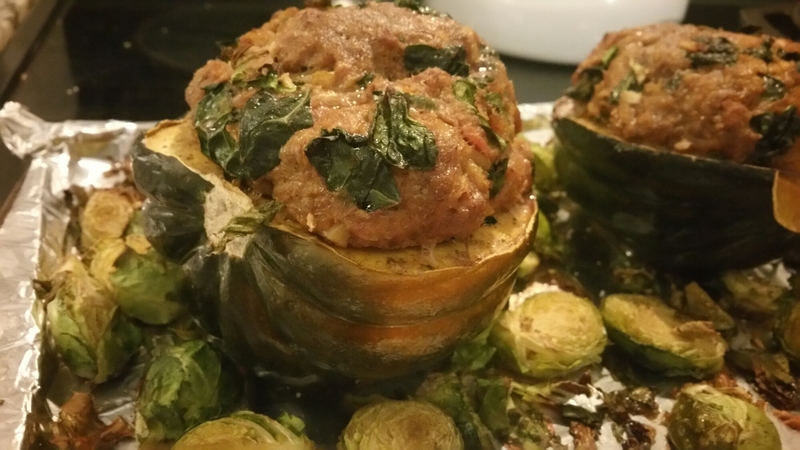 This is really one of those recipes that tastes a lot better than it looks, and both Chubby Hubby and I ate a good bit of it (leftovers are being set aside for lunch tomorrow), and agreed we would make it again soon. I hope this inspires you to try new things using the things you have on hand in new and creative ways! Let me know if you give this a try and if you like it! Alright, who’s missed me? Anyone? Anyone? Bueller? Just kidding. In all seriousness, my mom gave me a great tip a long time ago that my grandmother gave to her about how to make crust. They are a 1 to 1 ratio. For savory dishes, it’s 1 stick of butter/margarine, 1 cup of milk, and 1 cup of flour. For sweet dishes (like cobbler) it’s 1 stick of butter/margarine, 1 cup of milk, 1 cup of flour, and 1 cup of sugar/sweetener. 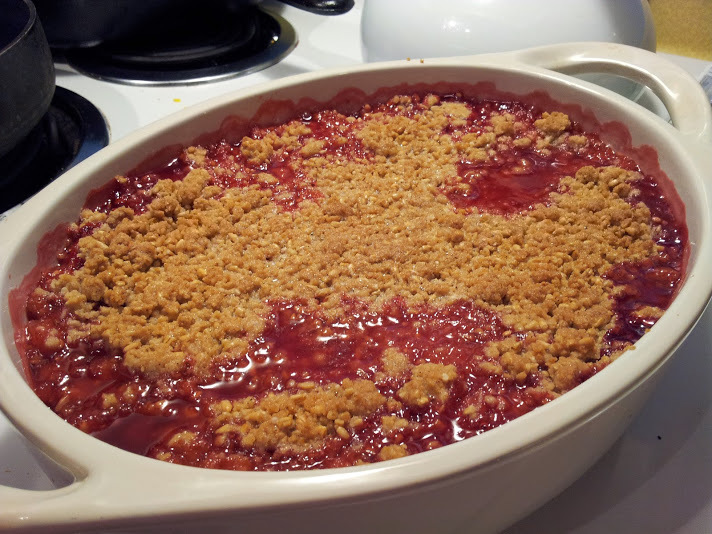 So when I saw fresh rhubarb at the farmer’s market, I thought I’d give a go at the cobbler. Playing on Pinterest, however , I found a recipe for a crisp, I thought it looked like an interesting twist. Found the recipe at Sugar and Spice by Celeste and it turned out quite good. 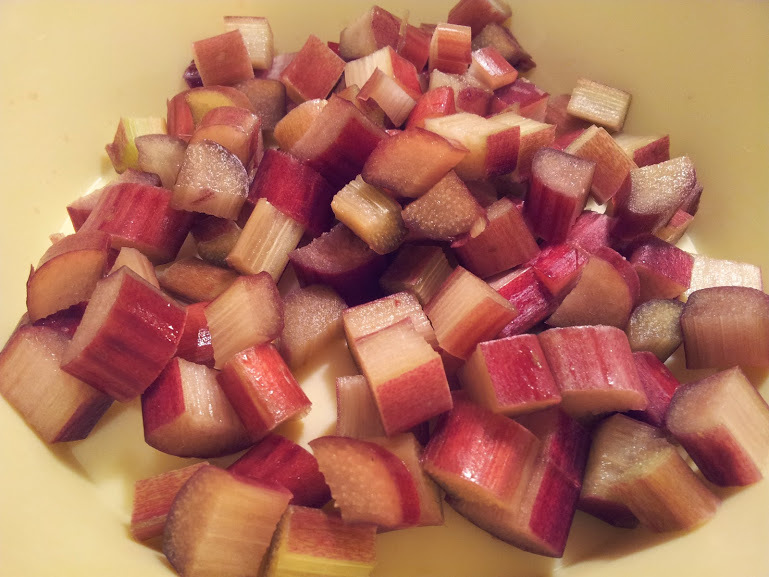 Chubby Hubby helped me wash and prepare the fruit…is rhubarb a fruit? I washed and prepared the filling and combined with the sugar and set aside to work on the crust. I softened the butter in the microwave (low heat guys!) and added all the other crust ingredients together. I mixed with my hands until it had the consistency of wet sand. I like to do this with my hands because you can get a better feel for when everything is combined. Chubby Hubby greased the dish with butter and added the filling to the pan. I put the crust on top and it was ready to slide into the oven at 350 degrees for 30-40 minutes. It would seem that this was a big hit with Chubby Hubby as only a small piece made it to daylight, and none made it to the following sun-down. Chubby Hubby reported that I could make this for him any time I felt like it. 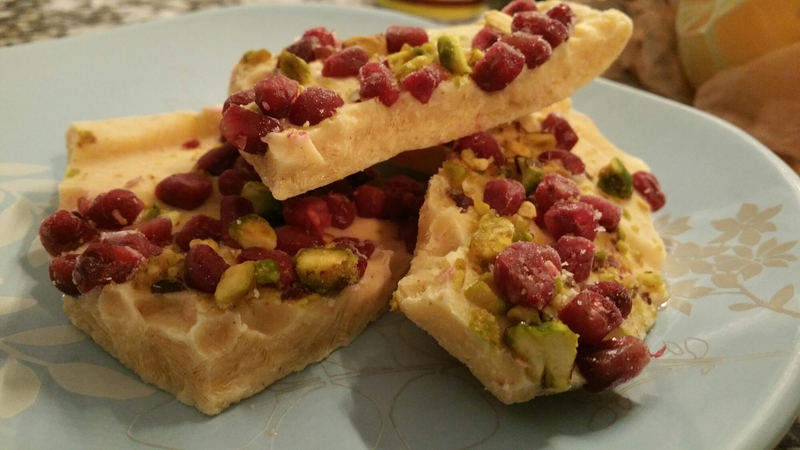 Contrary to what it may appear on this blog, I don’t make desserts often. We all deserve a treat now and then, and this was one to keep in the rotation for next now and then! Faithful readers, this week has taught me a lot of things. 1) We waste too much food. 2) We eat too little food. 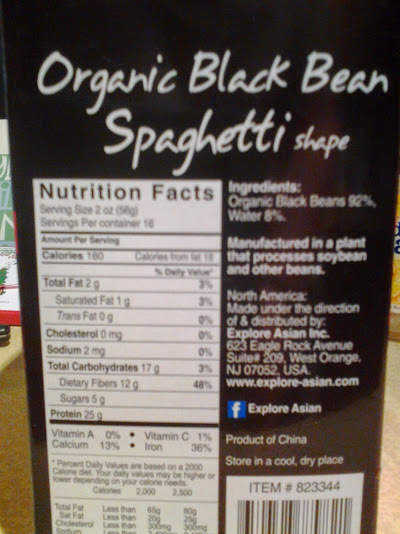 A lot of the stuff in my cabinets was/is heavily processed and full of edible ingredients that are not, in fact, food. So, the final day of the challenge. We ate oatmeal for breakfast, and peanut butter and jelly sandwiches for lunch (by sandwiches I mean he had an English muffin and I had a wrap since we were out of bread). Nothing we couldn’t handle and nothing we wouldn’t have done on a normal day anyway. I think the knowledge that we were so low on some things was messing with our heads more than the actual food we were eating. Dinner was another one of our quick, simple, “I’m hungry-and-tired and you’re hungry-and-tired” weeknight meals that we both enjoy. Simplest thing in the world, but very good. Smoked Sausage with Potatoes and Onion. Simply take a smoked sausage and slice it up (I try to do it on the bias just so it’s a little bit prettier, Chubby Hubby just slices it…men 🙂 ) along with some potatoes and an onion. There are options in regards to both to change the flavor or textures of the dish. We prefer to use Turkey smoked sausage as it’s a bit lighter in calories and is not greasy at all. We also generally use red potatoes because you can get such a nice crust on them when you roast them in a hot cast-iron skillet, and we prefer yellow or Vidalia/sweet onions to white because it’s a mellower flavor. We just heat our trusty cast-iron skillet in the over before we start the prep at about 400 degrees. This helps make a nice, crisp, crust on all the ingredients (as Chubby Hubby refers to it: crusty goodness). Then slice all the ingredients, toss them in a little olive or canola oil (we prefer olive in general) and season with salt and pepper, garlic powder, and cumin. CUMIN IS IMPORTANT TO THIS DISH. We’ve had it before with just salt and pepper, and it’s fine, nothing wrong with it. Add the cumin and it becomes a party. It’s just so much better with this little bit of extra smoky flavor. When the skillet is heated nicely, (carefully) add the ingredients to the skillet and roast for about 30 to 40 minutes, or until the potatoes get soft. We generally add an egg to the meal, and I prefer mine either “sunny-side-up” or “over-medium” for this meal. 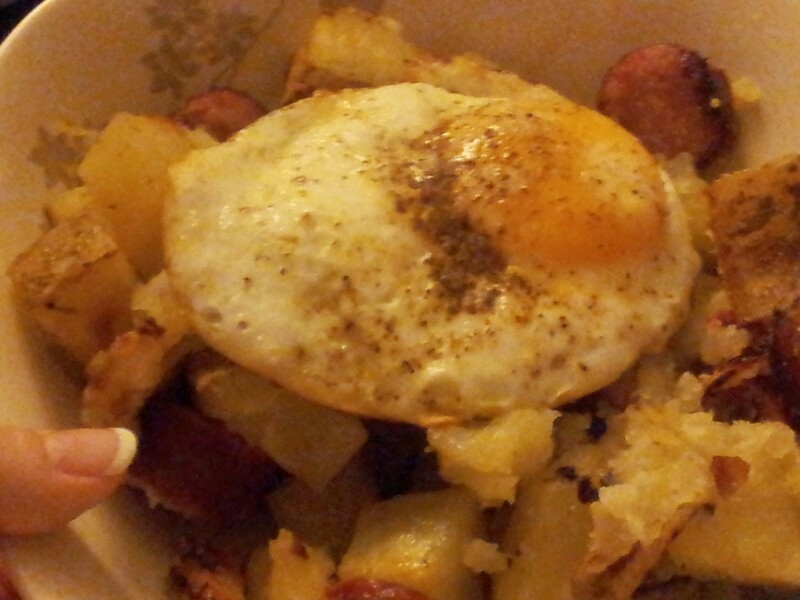 Chubby Hubby hates and detests the idea of a runny yolk, but when it’s all mixed in with the sausage and potatoes of this dish, it makes like this rich, yummy sauce and it just can’t be beat. So yummy, complete with “crusty goodness”. This is another one of our fallback meals, and it never disappoints.